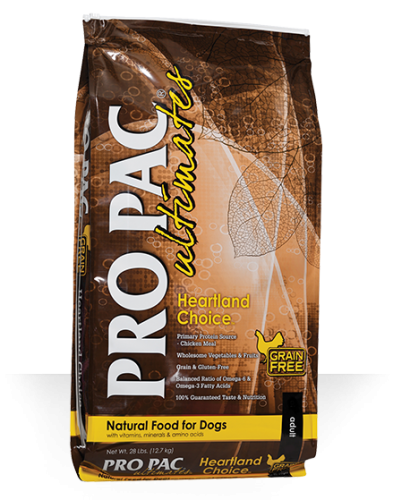 PRO PAC® Ultimates™ Heartland Choice™ is formulated to meet the nutritional levels established by the Association of American Feed Control Officials (AAFCO) Dog Food Nutrient Profiles for maintenance. 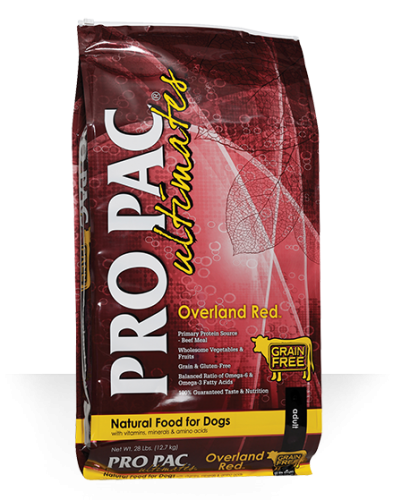 PRO PAC® Ultimates™ Overland Red™ is formulated to meet the nutritional levels established by the Association of American Feed Control Officials (AAFCO) Dog Food Nutrient Profiles for maintenance. 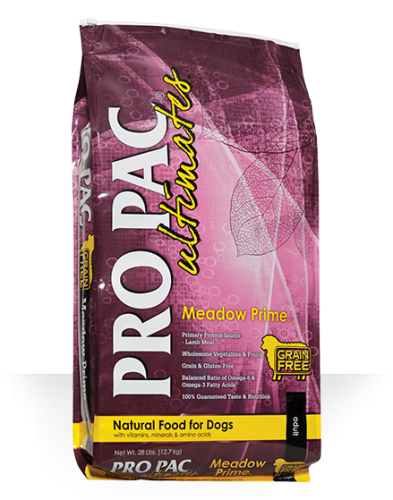 PRO PAC® Ultimates™ Meadow Prime™ is formulated to meet the nutritional levels established by the Association of American Feed Control Officials (AAFCO) Dog Food Nutrient Profiles for maintenance. 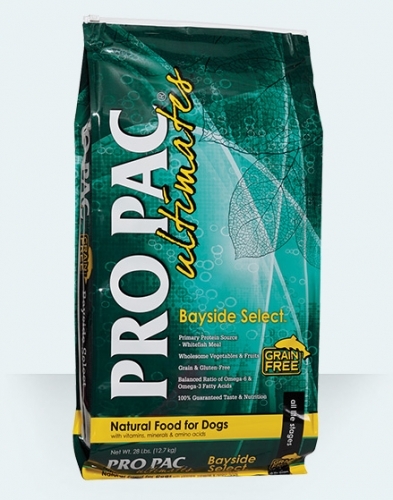 PRO PAC® Ultimates™ Bayside Select™ is formulated to meet the nutritional levels established by the Association of American Feed Control Officials (AAFCO) Dog Food Nutrient Profiles for all life stages including growth of large size dogs (70 lbs. or more as an adult). 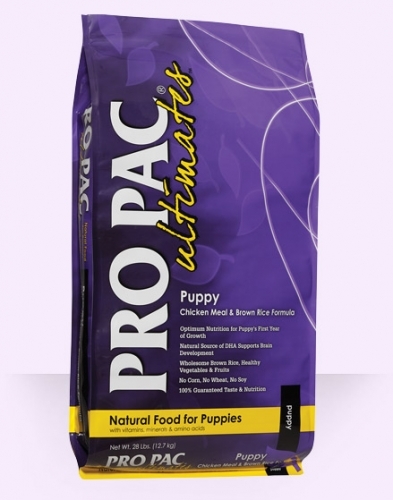 PRO PAC® Ultimates™ Puppy Chicken Meal & Brown Rice Formula is formulated to meet the nutritional levels established by the Association of American Feed Control Officials (AAFCO) Dog Food Nutrient Profiles for lactation/gestation, growth of dogs. 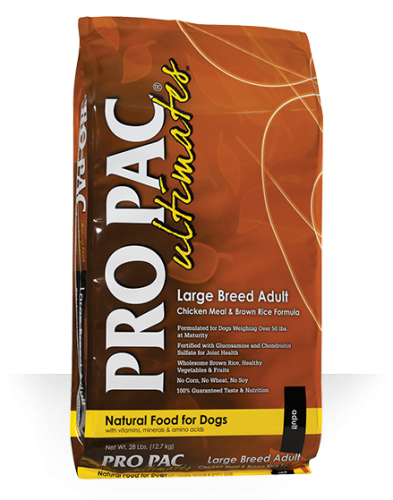 PRO PAC® Ultimates™ Large Breed Adult Chicken Meal & Rice Formula is formulated to meet the nutritional levels established by the Association of American Feed Control Officials (AAFCO) Dog Food Nutrient Profiles for maintenance. 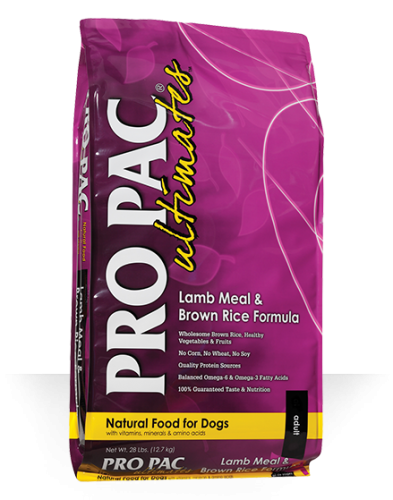 PRO PAC® Ultimates™ Lamb Meal & Brown Rice Formula is formulated to meet the nutritional levels established by the Association of American Feed Control Officials (AAFCO) Dog Food Nutrient Profiles for maintenance. 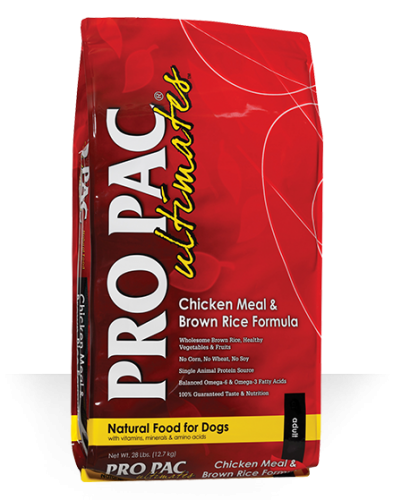 PRO PAC® Ultimates™ Chicken Meal & Brown Rice Formula is formulated to meet the nutritional levels established by the Association of American Feed Control Officials (AAFCO) Dog Food Nutrient Profiles for maintenance. The ingredients in Exclusive® Pet Food were chosen to give today’s dogs what they’ve always liked, and what they’ve always needed: real meat and real protein. It was true when dogs lived in the wild, and it’s true today. 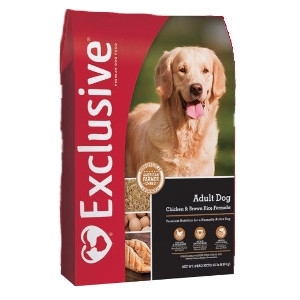 As a result, the #1 ingredient in Exclusive® Pet Food is savory, real meat including chicken, lamb, turkey or fish. We’ve also added a carefully-selected balance of antioxidant-rich fruits, and vegetables and wholesome grains to support their health — but left out the corn, soy, wheat and artificial flavors & preservatives. The exceptional ingredients in Exclusive® Dog Food were chosen to give today’s dogs what they’ve always liked, and what they’ve always needed: real meat and real protein. It was true when dogs lived in the wild, and it’s true today. 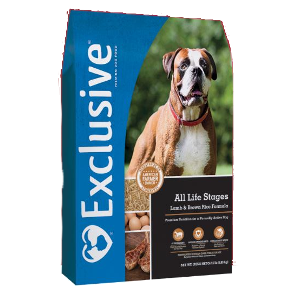 As a result, the #1 ingredient in Exclusive® Dog Food is savory, real meat including lamb, chicken, turkey or fish. We’ve also added a carefully-selected balance of fruits, vegetables and wholesome grains to support their health—but left out the corn, soy, wheat and artificial flavors & preservative. 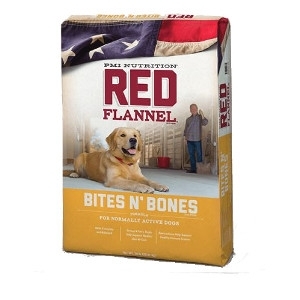 Red Flannel® Bites N’ Bones, a soy-free formula, is specially designed to help normally active dogs maintain lifelong health. 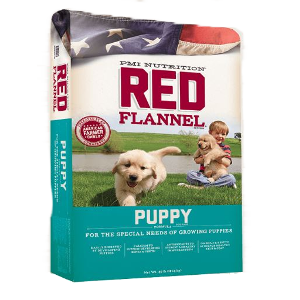 It supplies 100% complete and balanced nutrition for all life stages of normally active dogs. 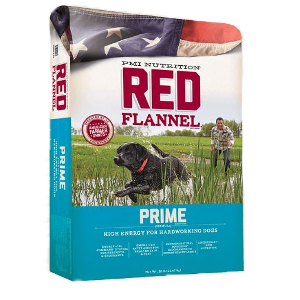 Red Flannel® Prime Formula is specifically designed to provide prolonged energy for hardworking dogs. 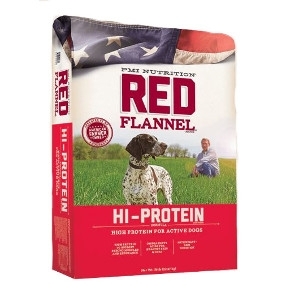 It supplies 100% complete and balanced nutrition for your dog at every life stage. 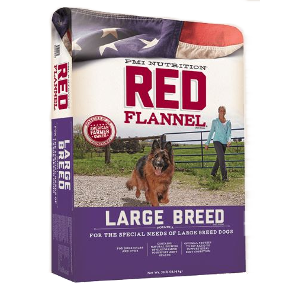 Red Flannel® Large Breed Adult Formula is specifically designed to address the unique needs of large breed adult dogs. It supplies 100% complete and balanced nutrition for maintenance of your adult large breed dog. 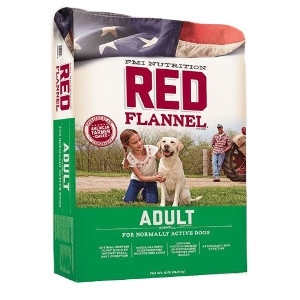 Red Flannel® Adult Formula is specifically designed to help normally active dogs maintain lifelong health. It supplies 100% complete and balanced nutrition for maintenance of the adult dog. 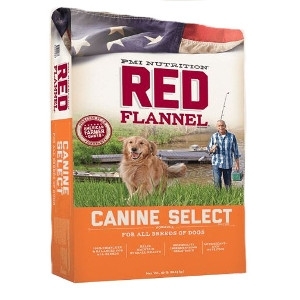 Red Flannel® Canine Select Formula is specifically formulated as an affordable diet for all breeds of adult dogs. 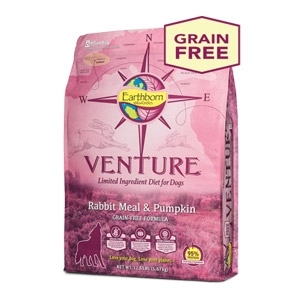 It supplies 100% complete and balanced nutrition for your dog at every life stage. 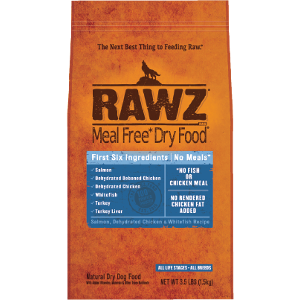 RAWZ® Limited Recipes are made with dogs with food sensitivities in mind. Recipe contains a limited number of ingredients and a single source of animal protein. Made with 100% rendered free ingredients, your dog can enjoy a complete and balanced diet that supports healthy skin and coat, without additional ingredients that may irritate their sensitive system. 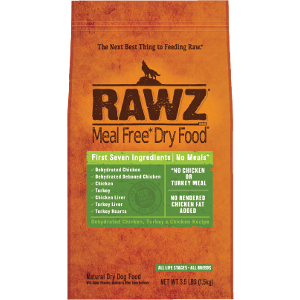 RAWZ® Limited Recipes are made with dogs with food sensitivities in mind. The recipe contains a limited number of ingredients and a single source of animal protein. Made with 100% rendered free ingredients, your dog can enjoy a complete and balanced diet that supports healthy skin and coat, without additional ingredients that may irritate their sensitive system. 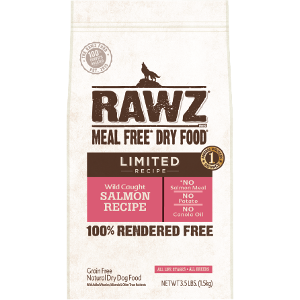 Made with 100% Rendered Free ingredients, RAWZ Meal Free Dry Food and Gum Free Wet Food provide your pet with the quality meat and healthy hydration they crave, without highly-processed meals, gums or fillers. We traveled to the coastal Pacific waters of Peru & Chile to find exotic Giant Squid for our Earthborn Holistic® Venture™ Squid & Chickpeas formula. Giant Squid provides a high level of digestible and balanced protein for dogs and is wild-caught by established fishing communities in South America. 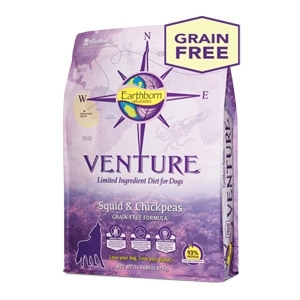 Also sold in restaurants as calamari, Giant Squid from South America makes this unique limited ingredient, grain-free diet a true delicacy for your dog. Added chickpeas from North America provide rich sources of key nutrients & fiber to help aid digestion. 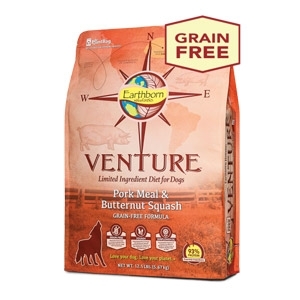 Travel to the Midwest for our hearty Earthborn Holistic® Venture™ Pork Meal & Butternut Squash diet. Our Pork Meal is made from genuine North American pork. Multi-generational family farms, which are quite common in the USA, stay true to their principles and practices of producing food responsibly. Pork farmers of Midwestern USA are committed to providing improved diets, better handling, and care and enhanced shelter protection to better suit their animals’ needs. Dedication to these daily efforts ensures the production of safe, quality pork products.